It's been quite a while since I posted about my quest to eliminate the clutter in our house without throwing things into the landfill with this year's #EcoClutterBuster project. I accomplished a major decluttering project this past week that I thought I'd share with you. 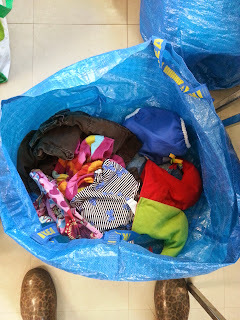 Last weekend I participated in a clothing & kids' stuff swap at a friend's housing co-op. It's the first I've been to in years, but I thought it would be a good idea to pass on some of the clothes that are a little too well-loved to consign & I haven't passed on to friends' children. 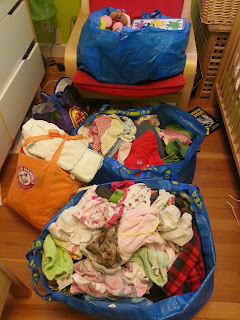 I have a few bags & bins where I toss clothing as they grow out of them. I pitch things of Bronte's in there a couple times a week--she's growing like a weed still--so I knew I'd have quite a bit to bring. Then I got to work sorting the too-small clothes, unused toys, & outgrown baby gear. I filled THREE Ikea bags, two large fabric shopping bags & tossed a few items on top of the pile. It was about the same volume as Bronte's crib, which is where most of the stuff was stored. Though I shouldn't let you think I'm as organized as to have it all in one place. I found maternity clothes in my room, gear, shoes & toys in the living room, clothes in the kids' closet, the bin behind their door, the crib, their dresser drawers, & a few things in our storage rooms too. If I'd had a small car, this stuff wouldn't have fit in the trunk. Luckily, the giant GoGetter panniers of our Yuba Mundo hold a ton of stuff & I was able to strap the rest on top of the rack, in the child seat & the BreadBasket. 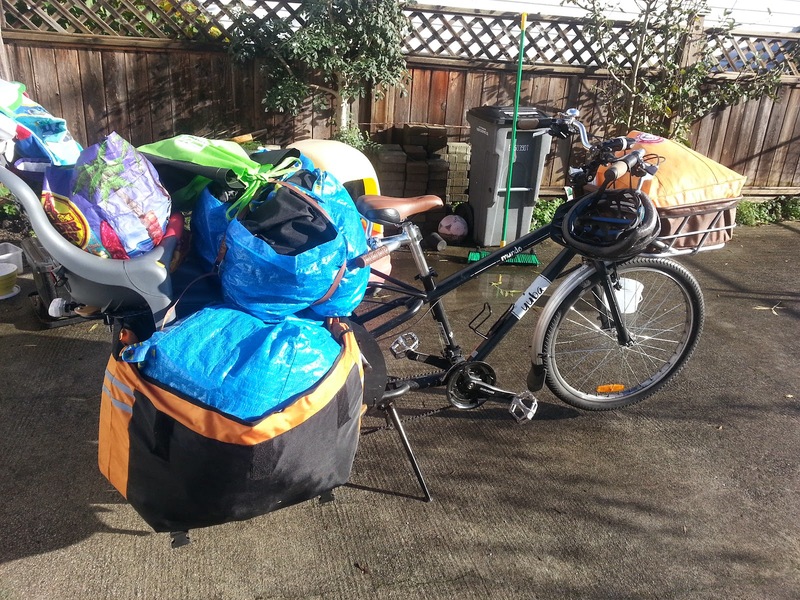 I'm not sure how much the load weighed, but from the way the bike handled, it wasn't more than when I bike Linnaeus, his friend, & Bronte to preschool one day a week. 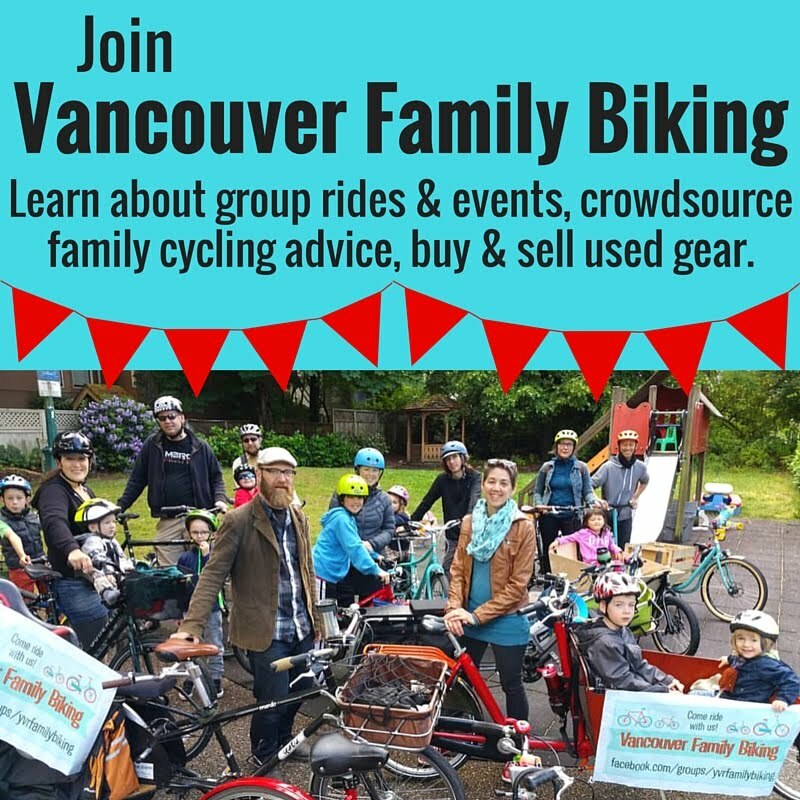 I got a lot of smiles & comments as I rode over to Commercial Drive in the gorgeous fall weather. Definitely a fun way to cut the clutter! I brought home seven items for the kids. I think the majority of what I brought went home with other families at the swap, but when I helped clean up, I noticed some going into the donation bags, to be picked up by the Developmental Disabilities Association, I believe. I did bring a few things home from the swap, but you can see from the pictures, it was definitely a huge net loss of clutter in our house!